Position a rack in the center of the oven and preheat to 325ºF (165ºC). Line the bottom of an ungreased 8-inch (20-cm) square cake pan with a piece of parchment paper cut to fit. In a large bowl, whisk together the oil, water, egg yolks and vanilla, then whisk in the 1⁄2 cup (100 g) sugar. Place a strainer over the bowl and sift the sweet rice, teff, and oat flours with the baking powder and salt directly into the yolk mixture, adding back any bits left behind in the strainer. Whisk until very smooth. In the clean, dry bowl of a stand mixer fitted with the whip attachment, whip the egg whites with the cream of tartar on medium-high speed until soft peaks form. Slowly add the remaining 2 tablespoons (20 g) sugar and whip until the whites are glossy and just hold a firm peak when lifted from the bowl, 1–3 more minutes. Use a flexible silicone spatula to fold one-third of the whites into the batter, then gently fold in the remaining whites until just combined and no streaks remain. Pour the batter into the prepared pan and smooth. Transfer to the oven and bake until the cake is golden, springs back to the touch and a toothpick inserted near the center comes out clean, 40–50 minutes. Remove to a rack and let cool completely in the pan. Loosen the edges with a thin knife or offset spatula, and invert the cake onto a cutting board. Peel away the parchment paper. Stir together the coffee, nocino and sugar until the sugar is dissolved. In the bowl of a stand mixer fitted with the whip attachment, whip together the mascarpone, cream, vanilla seeds, sugar and salt until the mixture holds firm peaks. Cover and chill until needed. Cut the cake in half, then cut crosswise into 1⁄2-inch thick slices. Lay 1 layer of cake slices cut side up in an 8- or 9-inch square pan or the equivalent. Drizzle with half of the coffee syrup. Spread the soaked cake with half of the whipped mascarpone and grate a good layer of chocolate directly over the cream, about 1 ounce (28 g). Repeat the layering process once more, ending with the grated chocolate. Serve right away with a spoon or chill for 1–2 hours or up to 1 day, and cut into slices to serve. Tiramisù keeps well, refrigerated airtight, for up to 3 days. 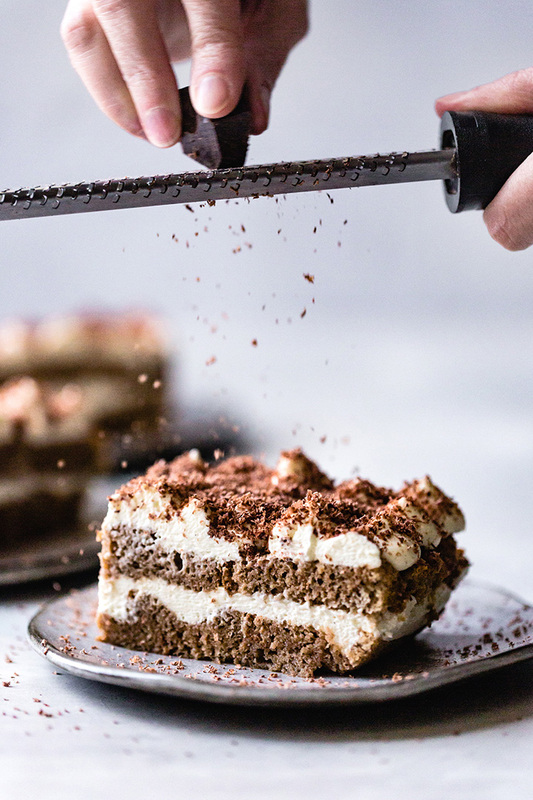 Teff tiramisu is an elegant, and gluten free, dessert!